On the semi-infinite square grid the structure of this C.A. contains "black" triangles and "gray" triangles (see the Links section). Both types of triangles have two sides of length 5^(1/2). Every black triangle has a base of length 2 hence its height is 2 and its area is 2. Every gray triangle has a base of length 2^(1/2) hence its height is 3/(2^(1/2)) and its area is 3/2. 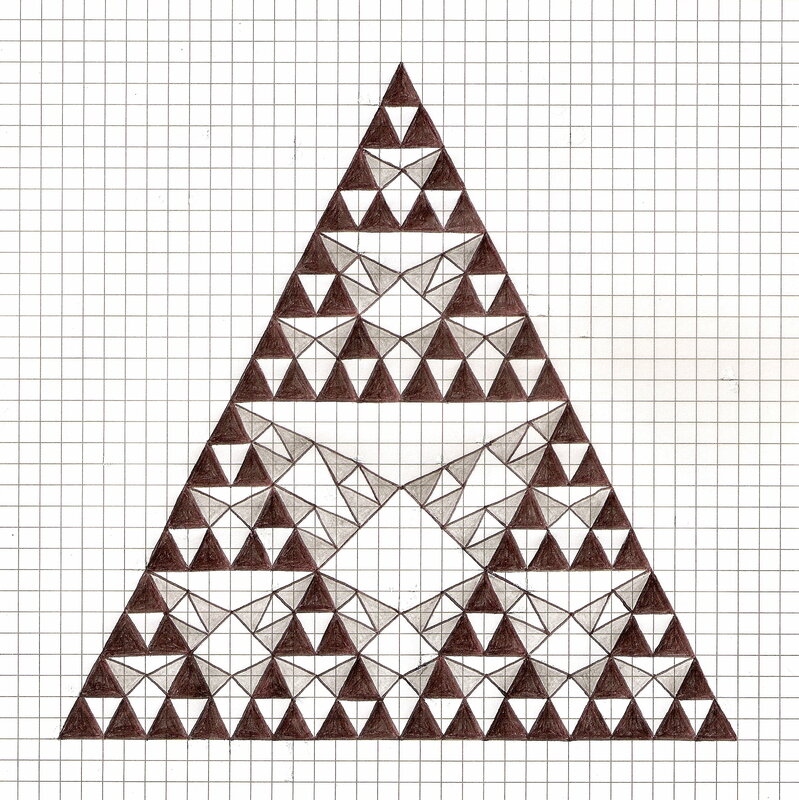 Both types of triangles are arranged in the same way as the triangles of Sierpinski gasket (see A047999 and A006046). The black triangles are arranged in vertical direction. On the other hand the gray triangles are arranged in diagonal direction in the holes of the structure formed by the black triangles. Note that the vertices of all triangles coincide with the grid points. The sequence gives the total number of triangles (black and gray) in the structure after n-th stage. A231349 (the first differences) gives the number of triangles added at n-th stage. For a more complex structure see A233780. Table of n, a(n) for n=0..64. We start at stage 0 with no triangles, so a(0) = 0. At stage 1 we add a black triangle, so a(1) = 1. At stage 2 we add two black triangles, so a(2) = 1+2 = 3. At stage 3 we add two black triangles and two gray triangles from the vertices of the master triangle, so a(3) = 3+2+2 = 7. At stage 4 we add four black triangles, so a(4) = 7+4 = 11. At stage 5 we add two black triangles and two gray triangles from the vertices of the master triangle, so a(5) = 11+2+2 = 15. At stage 6 we add four black triangles and four gray triangles, so a(6) = 15+4+4 = 23. At stage 7 we add four black triangles and six gray triangles, so a(7) = 23+4+6 = 33. At stage 8 we add eight black triangles, so a(8) = 33+8 = 41. Note that always we add both black triangles and gray triangles except if n is a power of 2. In this case at stage 2^k we add only 2^k black triangles, for k >= 0. Cf. A047999, A006046, A139250, A151566, A160406, A173530, A182634, A194444, A220524, A220478, A230981, A231349, A233780.